Officiating at the Waiea condominium groundbreaking were, from left, David Striph and David Weinreb of the Howard Hughes Corp., Gov. Neil Abercrombie and Kumu Hina Wong-Kalu. 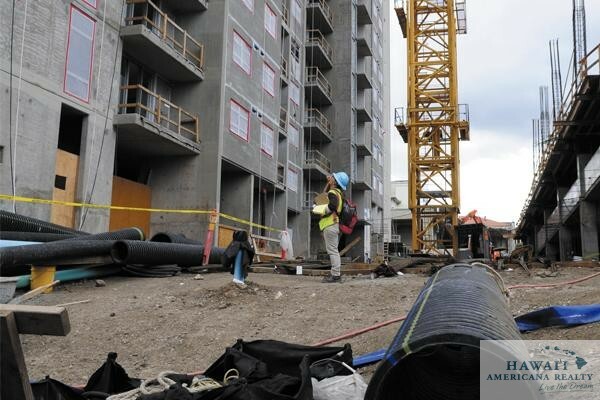 Kakaako has the necessary infrastructure to handle more than 20 new high-rise condominium towers and the retail development that will surround them, Honolulu Mayor Kirk Caldwell says. 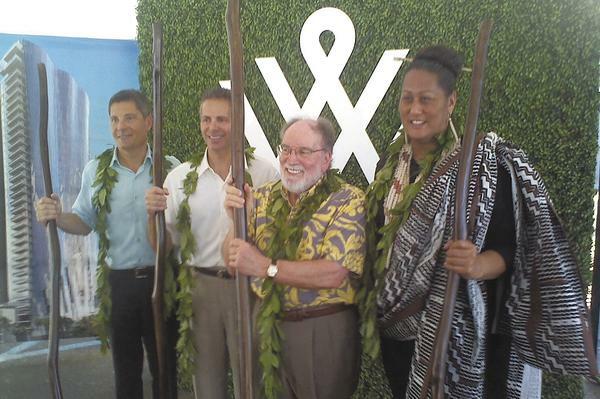 Caldwell made his assurances during a groundbreaking for the Waiea condominium tower at Ward Village last weekend. He said about $300 million has been invested in infrastructure improvements and that Kakaako is ready for high-rise development. He also pointed to a couple of towers that dot the skyline as examples of affordable housing in the neighborhood, in response to a question about whether people could afford to live in the area. 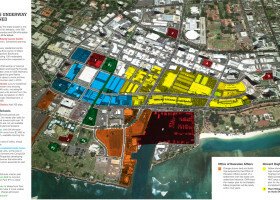 He added that Kakaako will have plenty of green space. Caldwell was joined by Howard Hughes Corp. President and CEO David Weinreb and Gov. Neil Abercrombie. 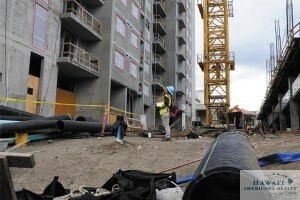 Abercrombie said the massive residential, commercial and retail community will be like nothing Hawaii has seen before. “Respect the past, but live in the present in order to create the future,” he told attendees, who included future residents of the Waiea tower, which is being built across from Ward Theatres. He said Ward Village represents a collaboration among political, economic and social circles that has never before existed in Hawaii. If things go according to plan, two luxury towers — Waiea and Anaha — will be built by the Howard Hughes Corp. and geared toward higher-income residents, but other, more affordable condominium towers also will be built. Also, Whole Foods Market intends to open a 50,000-square-foot store in Ward Village, just a few steps from the two towers. The Waiea project will have a total economic impact of $925 million and generate $2 million in annual property taxes for the City and County of Honolulu, said David Striph, senior vice president of Hawaii for the Howard Hughes Corp.
Former Kaneohe Ranch CEO Mitch D’Olier was the keynote speaker Monday at the 11th Annual NAIOP Hawaii Real Estate Symposium at the Hawaii Convention Center in Waikiki. Former Kaneohe Ranch CEO Mitch D’Olier has turned his attention from the Windward side of Oahu to Honolulu, with his take on the island’s so called “Third City” of Kakaako. D’Olier, who stepped down from his position as president and CEO of both Kaneohe Ranch and the Harold K.L. Castle Foundation — which sold their Hawaii commercial real estate assets that included a majority of Kailua town for $373 million to Alexander & Baldwin — is now the chairman of both boards. He said that while he does not mind tall buildings in Kakaako, he feels that the area could be planned out better. He noted that the state’s Hawaii Community Development Authority, which is overseeing the redevelopment of Kakaako, should do pedestrian planning, much like the project he helped oversee in Kailua. D’Olier, who worked in Kakaako when he was CEO of Victoria Ward Ltd., also said that he’d like to see a family-use plan in Kakaako, as well as a bike plan that utilizes government stream rights of way as bikeways rights of ways. 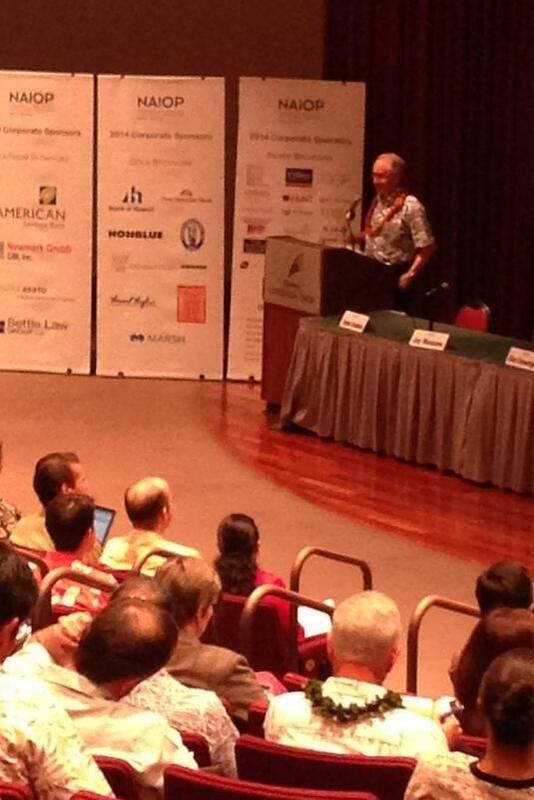 The former Hawaiian Airlines and Goodsill Anderson Quinn & Stifel executive, who is known to have a funny bone or two, started off his speech with the song “Reflections” by the Supremes on his iPhone, which he used to describe his current state.